Maty Mauk has six touchdown passes and four interceptions in four games this season. COLUMBIA, Mo. 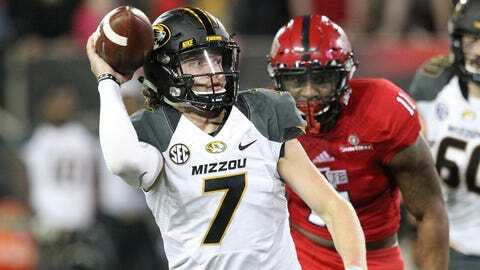 — Missouri has reinstated quarterback Maty Mauk from a suspension for violation of team rules, according to multiple reports Tuesday. It is not known whether Mauk will start in the Tigers’ next game Nov. 5 at home against Mississippi State. A school official would not confirm the move and said coach Gary Pinkel would address the situation on the SEC coaches’ teleconference Wednesday morning. Pinkel has not commented on Mauk’s status in recent weeks. After last week’s 10-3 loss at Vanderbilt, Pinkel was asked whether personnel changes were needed on offense and he replied, "We’re looking at everything." "It’s really easy to throw people all over the place," Pinkel added. "It’s my fault, so I’m charged with getting that changed." Pinkel said Missouri’s difficulties in the run game have made it much tougher on Lock. "He matures a lot," Pinkel said. "Any experience he has is new for him." Mauk is 17-5 as the starter. He has six touchdown passes and four interceptions in four games, while Lock has two touchdown passes and two interceptions.